I have a new hobby. 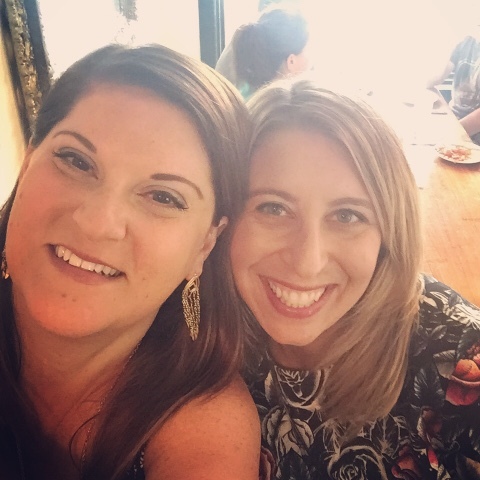 It's not very entertaining, unless you're obsessed with food, looking to get back in the kitchen after a summer of convenience foods and eating out, and/or looking to spur conversations about dinner in your household. If any of those things appeal to you, maybe you need to get this hobby in your life. It's called meal planning. How unsexy is that? It sounds so boring, throw-back, like something the poor housewives of the 1950s were forced to do. It sounds like a chore your grandmother wrestled with, all, "WhatEVER am I going to feed the family this week?" I've never been one to plan out an entire week of meals. Instead, I would go to the store and buy what looked good, then fly by the seat of my pants each evening, making whatever I felt like eating in the moment. But I'm older and wiser now. Oh, and I'm also older and marginally more exhausted at the end of the day. That means knowing exactly what I'm going to make when I get home is comforting. Not having to call a play while I'm already on the field, cold and hungry, is a good thing. The other perk is spending an hour or two over the weekend combing Pinterest, magazines, and cookbooks for recipe ideas. As I said before, I'm obsessed with food, so luxuriating in the process of selecting our dinners for the week, mixing cuisines and proteins, is kind of cool. Oh, and then I get to fantasize all week about whatever I'm making Thursday night. Is that weird? 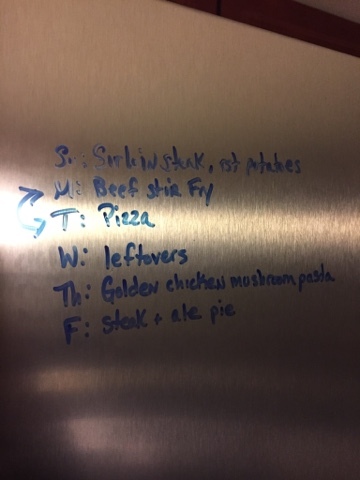 I almost forgot the other bonus: Shawn, heretofore an unwilling participant in dinner decisions, has, in the fridge-posting of my weekly plan, become suddenly much more active in the supper story. Our fridge is stainless steel, and basically acts as the white board for our house. We keep shopping lists and to do lists there, and now, our meal plan. This has let him in on the process in a way that me texting him at work, "what do you want for dinner?" never quite accomplished. The first week I posted a plan, he asked me every night if it was time for kielbasa vegetable bake yet. In days past, I would buy a package of boneless, skinless chicken breasts without a plan of how to use them, then get lazy on a Tuesday night, too hungry and tired to think straight, and sauté them up with dried spices, served with a boxed rice mix and frozen vegetables. 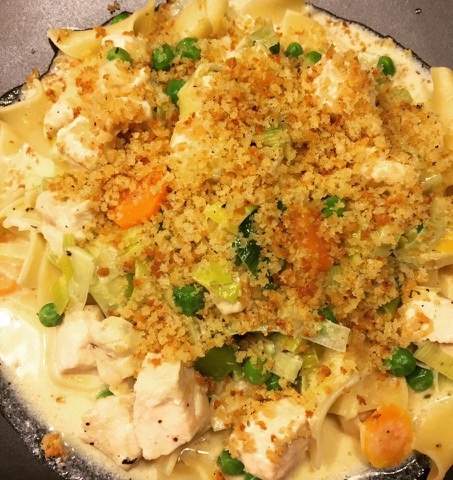 That's a fine meal, but doesn't chicken pot pie ragu with egg noodles sound better? Yup! I'd love to hear your take on this new hobby of mine. Do you meal plan? For you, what are the advantages of this seemingly unglamorous chore? 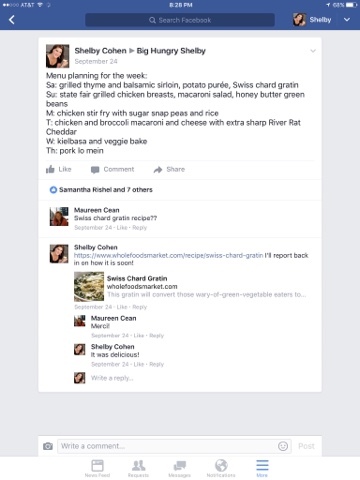 If you're a member of the Big Hungry Shelby group on Facebook, you've seen my meal plans the last few weeks. 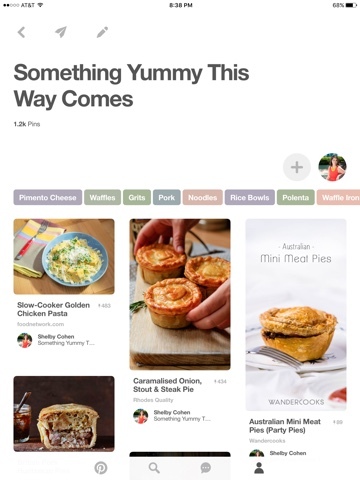 Have you tried any of the recipes for yourself? Sound off in the comments and let us know your tips and tricks! My hunger is big; my personality is bigger! About two years ago, an errant truck smashed through the wall of Simeon's on the Commons, in Ithaca, leaving destruction in its path. A few weeks ago, this stalwart of The Commons reopened, with a fresh, airy interior that's modern and classic at the same time - transom windows shining onto elaborately trimmed Wedgewood blue walls, and a marble bar with a two story mirror at its back. I had never eaten at Simeon's first incarnation, so Big Hungry Melinda and I chose it for brunch before a much-needed spa visit to August Moon Spa this past weekend. We began our repast, as we often do, with particularly delicious cocktails. This pear, coconut rum and lime concoction tasted like a tropical vacation enjoyed in a colonial mansion. 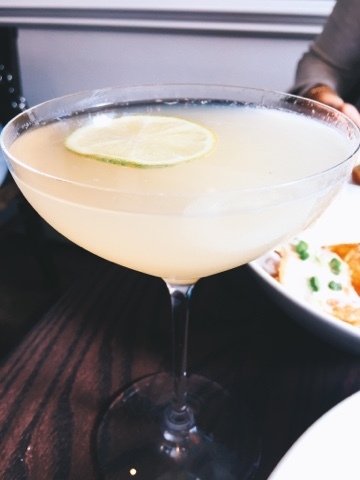 A sweet, light beverage to kick off a weekend brunch. 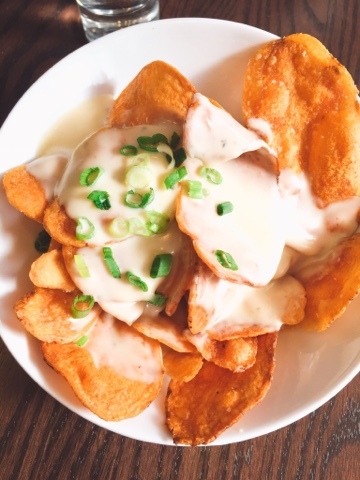 To counter the lightness of the drink, we ordered the house made chips with fondue sauce, which were crispy and earthy, topped with a mild cheese sauce not quite as distinctive as real Swiss fondue, but tasty nonetheless. The chopped scallions on top added a sharp bite to all the rich cheese. This dish is one you'll want to scarf down quickly, however - as the cheese cooled, it coagulated into a lumpy mess and made the potatoes soggy as well. 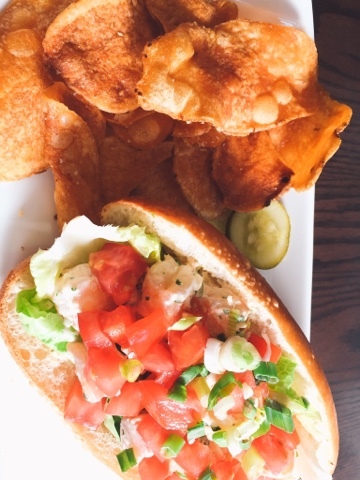 Melinda chose the shrimp roll as her entree, a light mix of chopped, poached shrimp, tomato and green onion, Bibb lettuce and cilantro mayo on a baguette. It was messy, the bits of seafood and vegetables tumbling off the roll with each bite, because while the shrimp was lightly dressed with the mayonnaise, the vegetables were not. But it was also fresh and light - a little easy on overall flavors, but a nice, summery sandwich. I headed in the breakfast direction with the biscuits and gravy, to which I added a couple over-easy eggs. After ordering, the table next to us received biscuits, and I fretted I had made the wrong choice, because the biscuits looked a bit wan and not particularly well risen. While these definitely weren't top notch southern biscuits, made with lard and Lily White flour and brushed generously with salted butter like the biscuits of my dreams, I needed have worried overall. 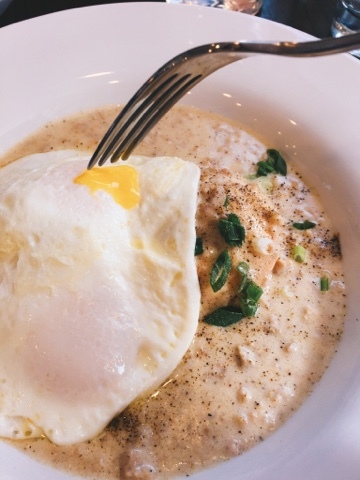 This was a savory, hearty dish, and though the biscuits themselves weren't the pinnacle, the sausage gravy had great flavor, and the runny egg yolks bathed the whole works in the requisite yellow richness to seal the deal. You can see the black pepper in the gravy, right? Pepper seems like such an ordinary ingredient, but in creamy gravies, this simple spice can man the difference between blandness and success. Someone in Simeon's kitchen may have a little too much enthusiasm for scallions, but I liked them here, as I had on the chips: they served almost like a squeeze of lemon - a bright punch to point the dish up. The creamy gravy was seasoned well, and contained lots of crumbled breakfast sausage. I wouldn't say the sausage had tremendous flavor in and of itself, but it worked with the cream and the pepper to hit all the requisite biscuits and gravy high points. We were too full for dessert this time around, but very much enjoyed our first visit to this newly redone Ithaca institution. I will be back to try the raw bar, for sure! Meantime, I give Simeon's on the Commons a seven on the BHS scale, for its absolutely gorgeous ambiance and simple, but well prepared food. This is a solid restart for The Commons' grande dame. I hope you try it out! It's been a minute since I've had a big meal out at a place that's new (or new to me), so I haven't had a full review to plan for the blog. But I have been enjoying my break from paid reviewing by revisiting some old favorites and really enjoying dining again. It's kind of nice not to always be working when I'm eating! One new-to-me spot I visited back in September was Gilda's, in Skaneateles. This place has been on my list for a couple years now, and it was lovely to finally bust inside her door and grab a seat at the bar with my friends to enjoy some day drinks and snacks. Even though Gilda's doesn't enjoy the stunning view of Skaneateles' busier, lakeside eatery Blue Water Grill, it makes up for it with a more relaxing, pristine interior, and much more fined food and service. 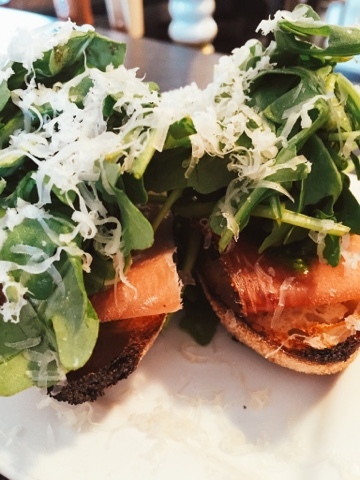 We began our repast with prosecco and some lovely speck and arugula crostini. This very simple starter was topped with grana padano cheese - mild and nutty, plus a little savory/sweet basil pesto. The speck (cured pork, like Spanish prosciutto) was salty and tender, sweet enough to stand up to the bitter greens. This was a satisfying small plate, and paired well with the dry sparkling wine. The hot sopressata pizza was my favorite thing at Gilda's, and I've thought about it ever since. 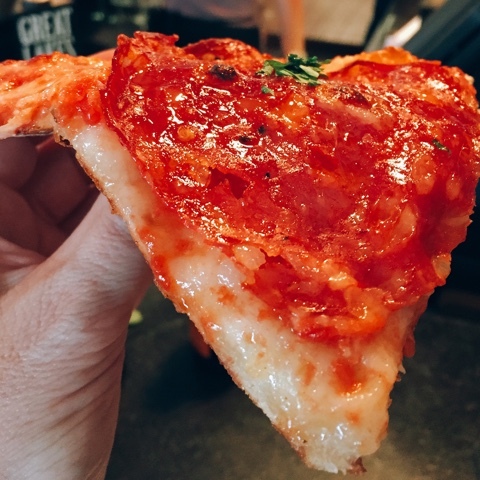 Along with paper-thin slices of the spiced salami, sweet tomato sauce, salty, aged mozzarella (with much more flavor than either the fresh, watery stuff or the drier, more solid bricks you make lasagna with), chile flakes, a little funky pecorino cheese were in play, plus honey. The honey made all the difference on this thin, seemingly simple but explosively flavorful, pie. It played with the sausage, sometimes letting spicy heat touch your tongue, but other bites cloaking that fire in its languid sweetness. The thin crust was flavorful, but not a major player in the taste profile when it faced these boisterous toppings. 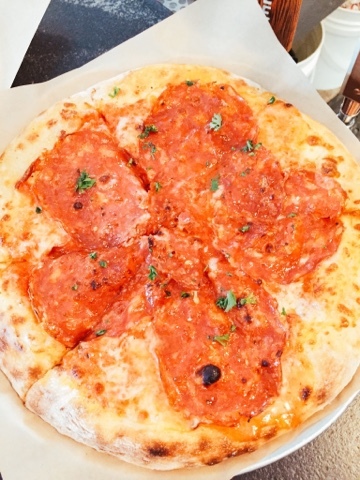 Maybe pizzerias with inferior dough should think about spicy salami and honey as a CYA tactic. Pancetta and fresh tomato topped the pizza special of the day, which we all split as well. It was good, but the flavors were much less complex than in the sopressata pie, which I preferred. 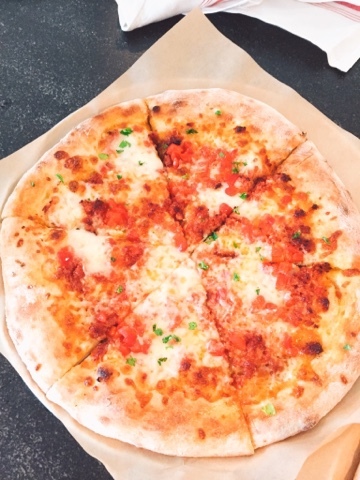 With the fresh tomato plus tomato sauce, the overall taste her was fresh and light, the cured bacon kind of anchoring everything with its earthy salinity. We didn't sample enough dishes at Gilda's to render a score, but if it helps, I will surely be back - and I have gossip! The people who own Gilda's are opening a Mexican restaurant soon on he main drag in Asian, and Thom Felicia, interior decorator extraordinaire from Queer Eye for the Straight Guy (remember him? ), who lives on the lake, is collaborating!! Yeah, that's right, this is a double exclamation point occurrence. BHS loves Mexican food and fabulous design! We grabbed dinner a few weeks back at Mr. Bigg's new location, downtown in Watertown. The space is lovely, and Eddy has clearly worked really hard to warm up the space and create some ambiance. I fear he's struggling, though, in this larger spot and without the built-in traffic the mall provided. 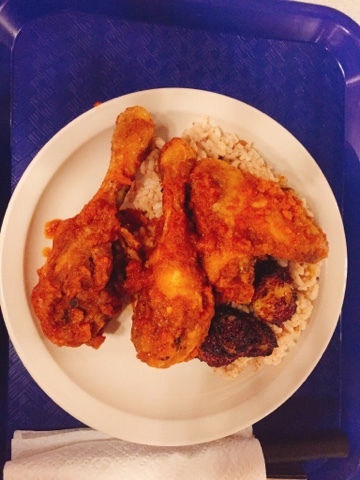 While Eddy's flavors were still on point in the fried chicken and stew chicken we ordered - that spicy, savory stew chicken sauce is ridiculously good - the chicken itself was scrawny, tough, without much meat on the legs, which were the only parts we were served beside one very small wing. Look, I'm all about peasant food, but there has to be enough meat to make a meal, and neither of these plates had that. The jerk pork, as well, was very tough. Again, the flavors were all spot-on, but the meats were probably a lower quality than one would prefer. I'm guessing that's to help make ends meet, and that's a shame. Starting with top notch ingredients is the first step in restaurant success. I hate to report this, but the rice with my stew chicken was also majorly overcooked - all flabby and blown-out. Look, I have affection for Eddy, and I want him to do well. But I also can't recommend you eat there if the food isn't on point. It's a real conundrum. I'm hoping it sorts itself out, because I'd hate to see Mr. Bigg's cuisine disappear from the city. 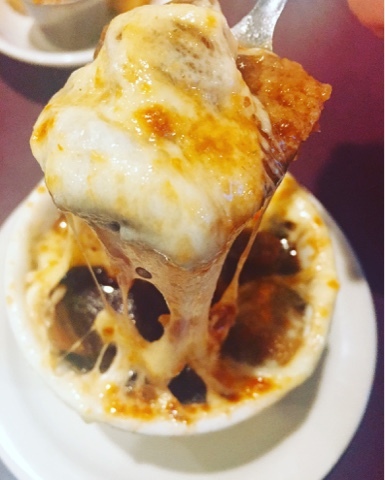 Last weekend, after putting on the Miss Thousand Islands' Outstanding Tren Pageant at LaFargeville Central Scool, we hauled our tired cookies into Shuler's, on Watertown's Northside, for some grub from their comfort food menu. I had fretted earlier this year that maybe this palace of gravy and carbohydrates might not be faring all that well, but on this Saturday night, the joint was hopping. Fried cheese curds? Check! 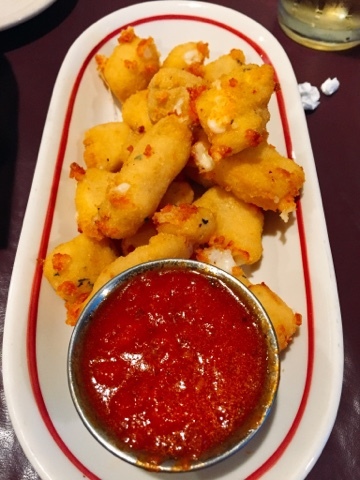 These golden nuggets of blessed junk food were pleasantly salty, wonderfully chewy, and absolutely decadent dunked in the bright, sweet tomato sauce. Need I say more? My chicken and biscuits were spot on, too, but much less photogenic. 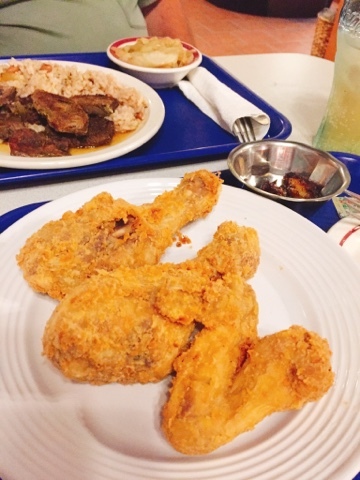 Rest assured, this classic Watertown family restaurant has still got all the goods when you need warm, filling, flavorful American food without a hint of complexity, fusion, or international influence. Just the basics, done right. Oh, and they've completed their makeover since I was there last - the dining room is refreshed and brightened up. So much nicer than the seventies den it once was! - Binghamton's The Night Kitchen has closed, and before I could make it there to sample its southern fair. Count me bummed. - STIR's Fall Tasting Party is this Sunday at Traditions at the Glen. You should go! - More sad news: Treasure Ice Cream and Cafe, in Endwell, has also closed. I haven't talked to its owner, Sue, yet to find out what happened, but you know my conclusion: we have to patronize our local restaurants! These small businesses are where all the good stuff is, and they are so vital to our local economy. Just say no to chains, people. Please unchain your tastebuds and give mom and pop restaurants top billing when you're choosing where to eat! My personality is big; my hunger is bigger!